More than 500 volunteers are needed to train as volunteers to help low-to-moderate income families receive the benefits they have earned through its VITA (Volunteer Income Tax Assistance) Program. 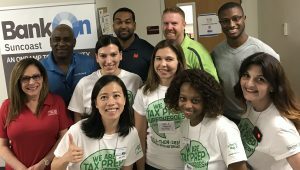 Volunteers receive between four and 30 hours of IRS training depending on the position selected, and volunteer at one of the 40+ regional tax locations during the tax filing season from mid-January through mid-April. There are volunteer locations throughout Hillsborough, Pinellas, Sarasota and DeSoto counties offering day, evening, and weekend opportunities. The VITA volunteer is responsible for preparing tax returns for low-to-moderate income individuals. These returns are then checked by a trained quality reviewer for accuracy and then submitted to the IRS. No tax experience is required. Free IRS-Certified training is provided! Volunteers must be comfortable in a fast-paced environment while displaying a supportive and professional disposition with diverse populations. Tax Preparation volunteers must be comfortable working with computers. The Site Coordinator will receive IRS-sponsored training on income tax law for the types of returns that are within scope for the VITA program. Volunteers are also needed as greeters/intake specialists, quality reviewers and translators. Basic training will be provided for these roles. Hours needed are the same as the tax preparers. VITA volunteering is a great opportunity to meet new people, improve your skills, and make a big difference in the lives of thousands. VITA volunteers are frequently college students, actively working adults and retired or semi-retired individuals who enjoy the satisfaction of giving back, learning new skills and being able to volunteer while using their past life and work experience to help those in need. With the help of VITA volunteers last tax season, the United Way Suncoast and its community partners completed over 19,000 returns. This equated over $16.5 million in refunds going back to the community to deserving individuals and families. United Way Suncoast also offers free online tax preparation and filing for individuals making less than $66,000 a year. Learn more about this program at www.myfreetaxes.com. For more information or to volunteer visit www.unitedwaysuncoast.org/taxhelpvolunteers or contact Margarita Perez at 813-274-0920 or VITA@uwsuncoast.org. To find Suncoast-area volunteer opportunities, visit www.volunteersuncoast.org. For more information, please call 941.748.1313 (Manatee office), 941.366.2686 (Sarasota office) or 813.274.0933 (Tampa office) or visit www.unitedwaysuncoast.org.